There is nothing like an oozing blueberry pancake. The fatty ones that are jam-packed with blueberries. This was truly a summer delight, no frozen blueberries please, only fresh will do. This dish was inspired by my homecoming. Since, I moved back home yesterday, I have to make the most of the situ, and not let fresh blueberries go to waste. It was a welcoming dish, even if I did make it for myself, and my family was delighted. Only thing is, I can't stand the floral decorated plates we have, that seem to take away the essence of the dish, and reduce it to a little too bourgeoise for me. So I searched the place for a simple white or black dish. The best I could find was a white dish that my little brother painted in 1994 of the whole family. So, the pancakes couldn't call out "home" any louder, served on this hand-drawn dish. Hope you enjoy the homey touch just as much as I did. These are real easy to make and don't require too many outlandish ingredients. Just make sure you have blueberries and milk, which is usually what the hold up is about. Oh yea, make sure you eat them with your favorite maple syrup or brown sugar, or powered sugar, any way you like em. I had to add bananas because they just sweeten them up like nobody's business. And, I think because Jack Johnson's song, "Banana Pancakes" has really gotten in my head. So, just for fun, here is a link to the inspiration, himself. Thanks to somebody named Todd, who posted the original pancake recipe on allrecipes.com. I revised it a little to fit my taste, but he did the rough work. 2. In a large bowl, sift flour. Add salt, baking powder and sugar. In a small bowl, beat together egg and milk. Stir milk and egg into the flour mixture. Mix in the butter and fold in the blueberries. Here I add the lemon zest, and a little cinnamon and/or nutmeg if desired (teaspoons). Set aside for 1 hour. I couldn't wait this long for breakfast so I made them right away and they were still great. If you wait, the pancakes will be more flat like a flapjack and rise less. 3. Heat a lightly oiled griddle or frying pan over medium high heat. Scoop a small amount of batter onto the griddle. I like to use a soup ladle, if you don't have any easy pour sprout on the bowl. If you would like to add bananas, I like to lay them right on top of the batter, so that when I flip them, the bananas can caramelize. Brown on both sides and serve hot. Turn them when bubbles form throughout the pancake. The second side cooks faster than the first, so be sure to turn down the heat. 4. When finished, place them on a plate and cover with foil to keep warm. If you have to wait awhile until eating, place the plate in the oven (turned off) to keep the heat in. Serve warm with maple syrup. Revel in your American-ness, if you are. Many knowledge and information I got from your site, especially about blueberry banana pancakes, thanks and greetings of friendship. 🇫🇷 Only 3 spots left! Changed date to Friday, November 4th. 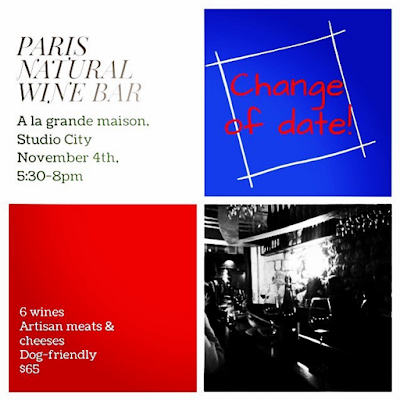 Don't miss an opportunity to experience a natural wine bar with sustainable French wines, cheese, meats and homemade sourdough bread. I'm so excited to announce the debut of my first ever recipe eBook! 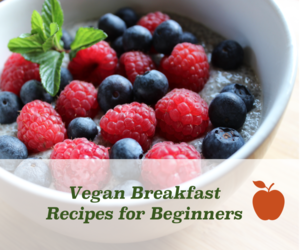 It's short and sweet but full of great Vegan breakfasts. I'm offering you a free download for visiting my site. Let me know what you think and if you try any of the recipes, leave a comment below on how it went! I wanted to post this now, as every one is in the middle of the holidays, and maybe thinking they ate too much pumpkin pie or sweet treats in the office. Balance it out with these healthy vegan breakfasts so you feel lighter, and energized throughout the day! Want to learn more about healthy diets? 4 Hot Diets Explained5 Important Spices for HealthWhat is Ayurveda? Tabuli is the curious traveler that visits our holiday celebrations. It is not a particularly wintery dish, but it has a cultural place in our tradition. It is a simple Middle Eastern dish that is prepared much the same as a salsa, lots of chopped fresh and fragrant ingredients, with the addition of bulgur wheat which gives the dish body, and makes it a complete dish with protein. My family makes this for Christmas each year and it’s a great light dish for leftovers. Its a side salad who's a confetti beauty on the dinner table with the various greens and small dice. This is the traditional way my Grandma and Mom always make it, and doesn’t need a thing added to it. Keep it fresh! In addition to its beauty on the dinner table, this is a raw dish packed with antioxidants. While I am not an official raw chef, I dabble in it at times. When I need reference, I go to resources by this amazing bodybuilder and THE raw chef, Kristen.